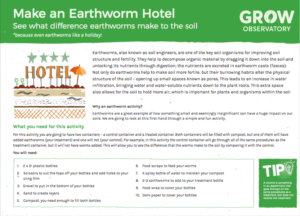 See what difference earthworms make to the soil! Earthworms, also known as soil engineers, are one of the key soil organisms for improving soil structure and fertility. They help to decompose organic material by dragging it down into the soil and unlocking its nutrients through digestion; the nutrients are excreted in earthworm casts (faeces). Not only do earthworms help to make soil more fertile, but their burrowing habits alter the physical structure of the soil – opening up small spaces known as pores. This leads to an increase in water infiltration, bringing water and water-soluble nutrients down to the plant roots. This extra space also allows for the soil to hold more air, which is important for plants and organisms within the soil.